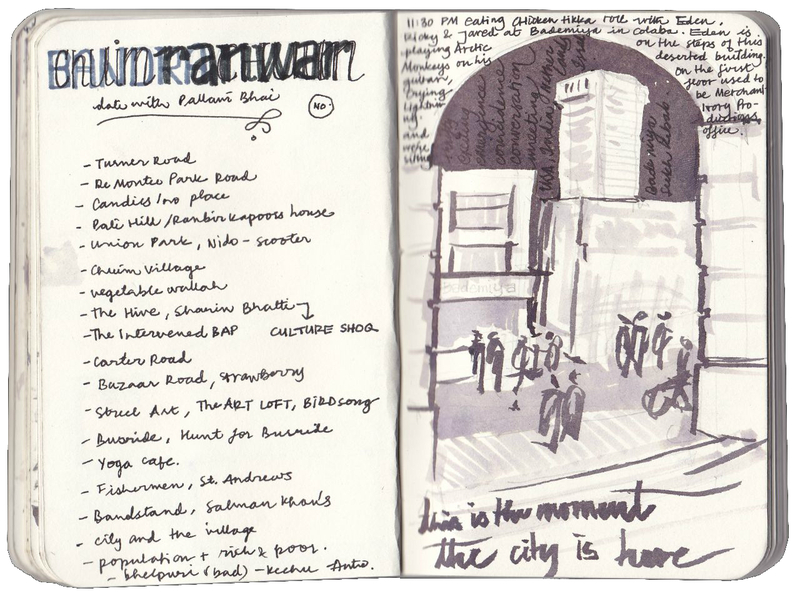 Rohan Patankar is a Delhi-based architect who loves to read, listen, draw, write and delve into the realm of creative spaces, both in terms of function and value. 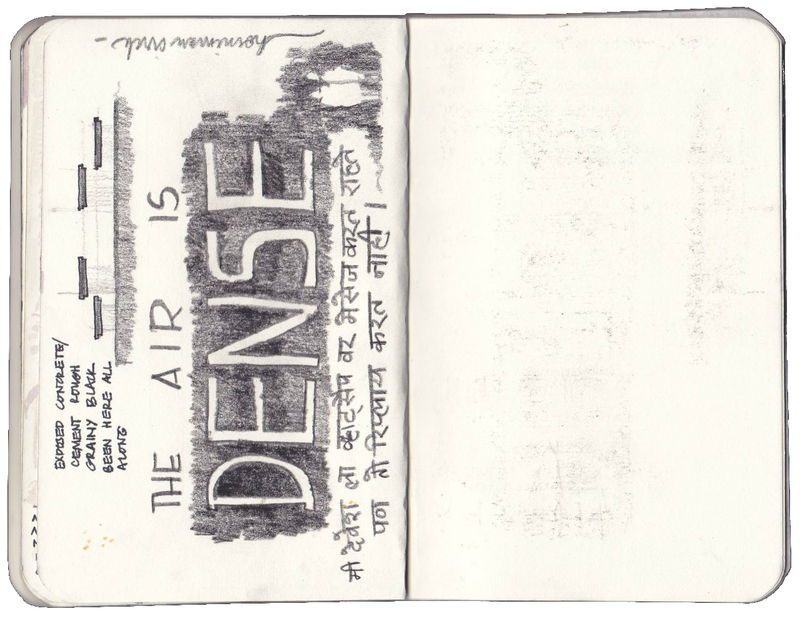 He presently works at Co.Lab design architecture studio and also initiates Delhi Dallying, where a bunch of interesting people write, organize walks, workshops and interactive events. This piece was originally published in The Scribbler. 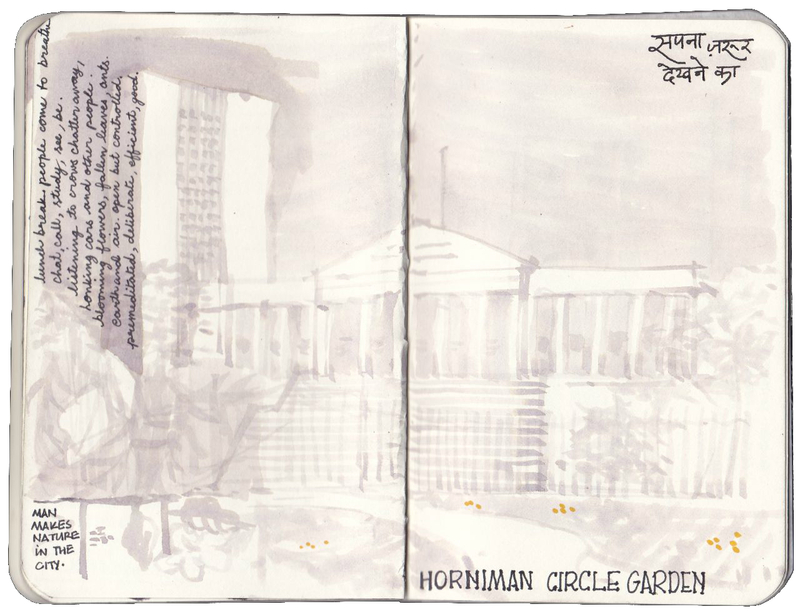 Comment: Rohan’s fluid and evocative drawings combined with his quirky observations about his experience of Bombay were much appreciated, with one judge practically swooning at the quality of his artwork! As for me, I really like the twist at the end…. In March 2014, I was in Mumbai for a short solo vacation in the city. 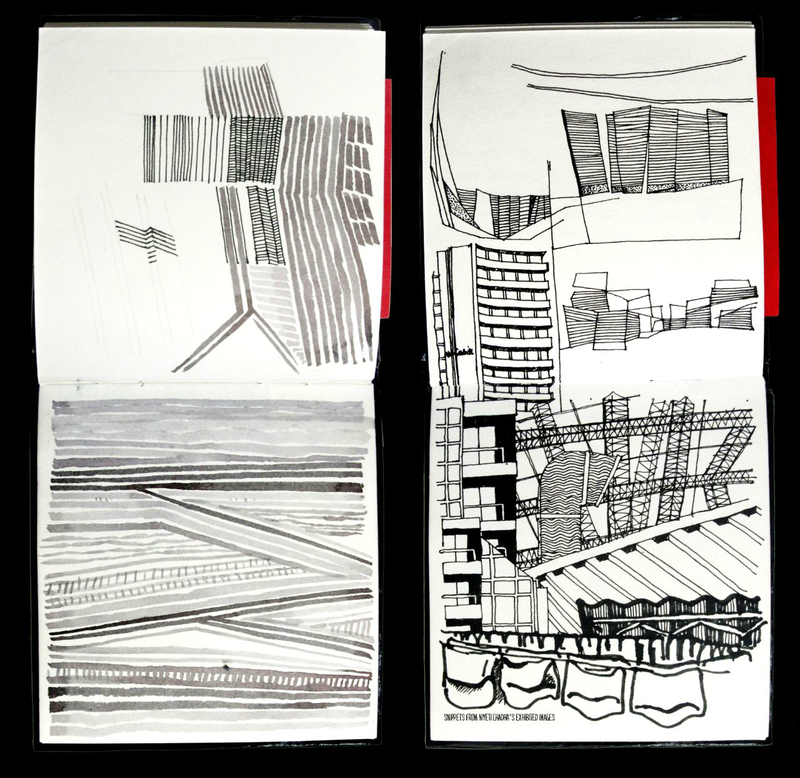 The intention was to just absorb some energy from the city; draw of it and draw from it. 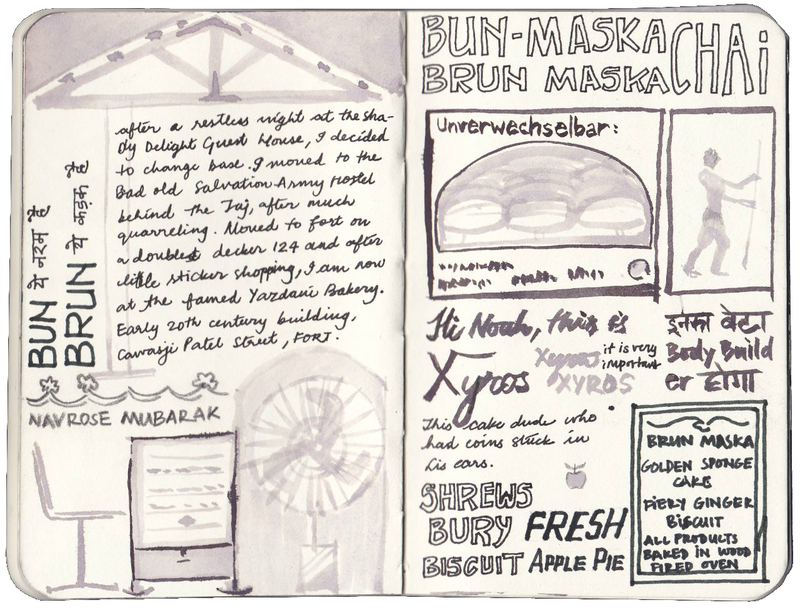 After these few years of Delhi Dallying, being vaguely familiar to Bombay and its local language, I meant to quickly break the touristy ice and get some local flavour. 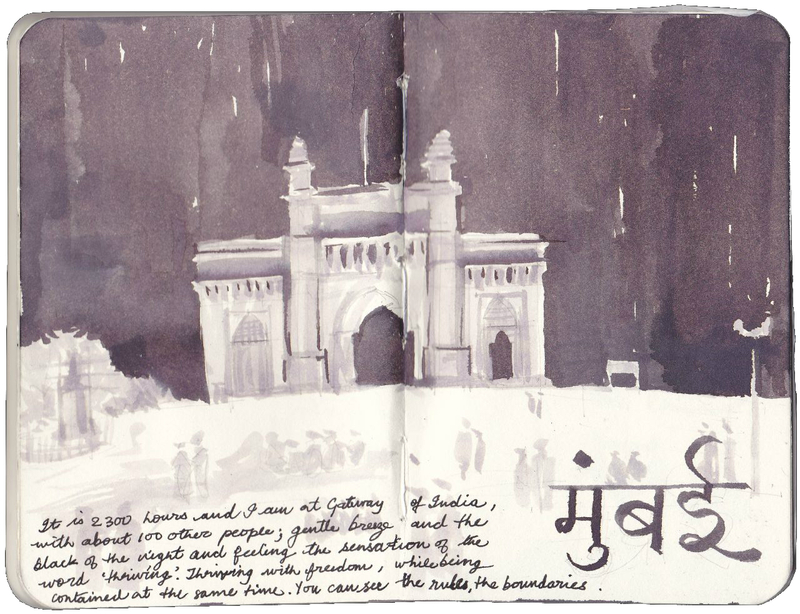 Still doubtful about what it was exactly that I wanted to do walking around town all alone; my uncle jokingly insisted that I could never get the real feel of Bombay until I spent a night on a footpath. Having lived in the city for almost all his adult life, he claimed to have never even wanted to get this “real feel” of the city for himself. While I decided consciously to have no music playing in my ears when I was out, I was listening to Avishai Cohen’s Gently Disturbed in all the off time I got. He seemed to be getting the vibe of the city quite well; articulating an underlying structure that one can surely sense but cannot decipher completely. 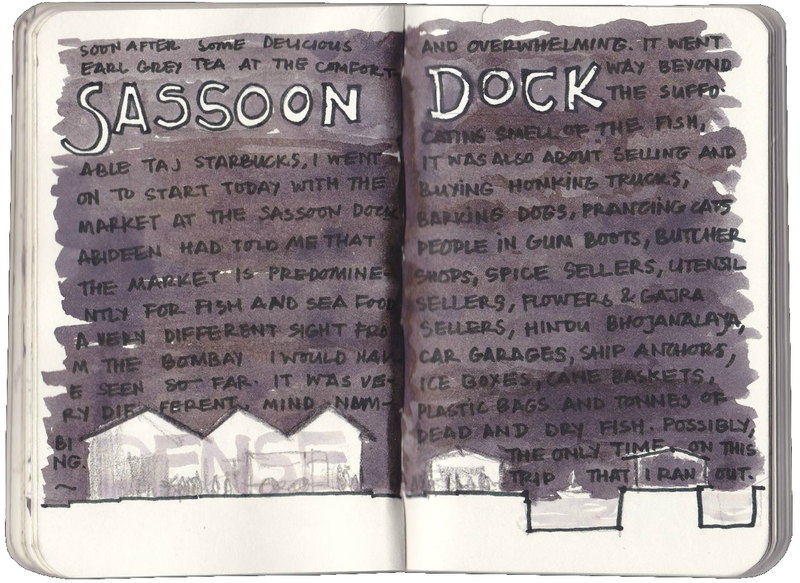 I began with visiting the ancient Sassoon docks, followed by some landmark eateries and public squares in South Bombay. The fresh catch from the sea, the morning flowers and the market of ordinary things by the docks made for one of the most (overwhelmingly) memorable sensations of this trip. Walking through the buildings of colonial lineage at Fort and Ballard Estate, I sensed this comfort for the human scale. The formal building edge, the generous footpath and the sufficiently wide road seemed to really make it comfortable for people and cars. The synergy in the city felt home-grown and deliberate, and somehow, far more mature than what I experience in Delhi usually. The vivid neighbourhoods and market streets of Dhobi Talao and Bhuleshwar were full of diverse building features and shop signs reading in many many local languages. The public space seemed to have been owned and claimed by people since forever. The threshold of the big Krishna temple at Bhuleshwar had me teleported from this busy transactional hub to a humble un-urbane courtyard. The chatter of the old Gujarati women and men seemed to be suspended in time across all of this space. Walking along Marine Drive, I was quite surprised to see that many Gymkhana Maidans along the Marine Drive did not have any real boundary wall facing the main street. In an instant, the street felt wider and the open space more public. The Banganga tank in Walkeshwar; this ancient urban oasis seemed unchanging in the face of all the bustle and transformation of the city. It appeared to anchor all the temples that marked the edge of its steps, holding together the essence of the neighbourhood. Lower Parel was quite a heady mix of the old and the intervened, with many elegant multi-storey glass buildings abutting grimly old low lying neighbourhoods. This looked like a story of aggressive urban transformation that I think would have had equally powerful social consequences. My taxi cab driver told me that most of these towers were built on mill sites. I walked through the Mathuradas Mill Compound where most mill buildings are converted into clubs and restaurants. The adaptive reuse was interesting indeed, but the establishments in this compound just felt disconnected from their setting, almost oblivious and opaque. It felt like the city here had been de-urbanized and reduced to architecture; mere buildings in cement and steel to work with. 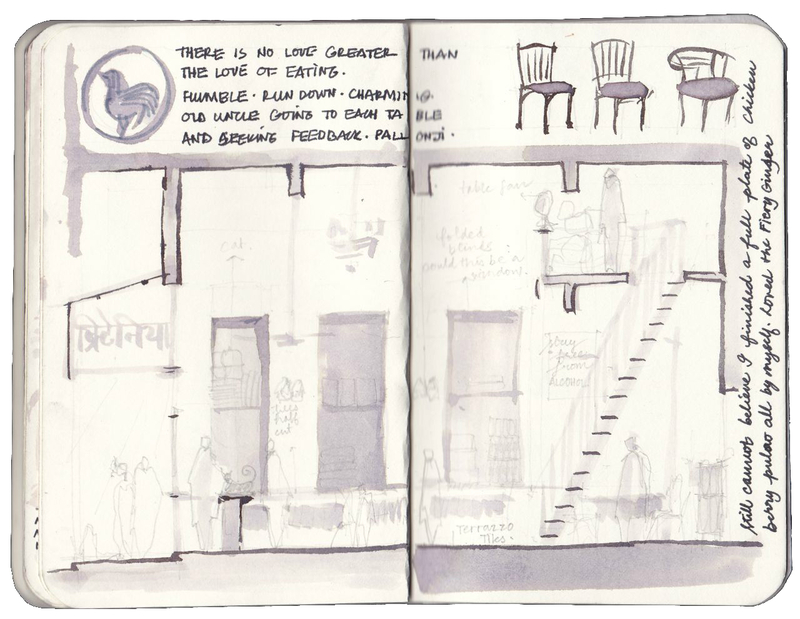 I then went to Bandra to meet my architect friend Pallavi who showed me around. After lunching at the maze like Candies, we walked to the villages of Chuim and Ranwar. Starkly different from the intense urban villages of Delhi, this was pleasant. Walking across the main bazaar street selling fruit and everyday things we reached the back lanes that housed quaint cafes and pretty homes amid street art. There were many people and houses, rich and poor; young and old, but essentially ordinary and comfortable. 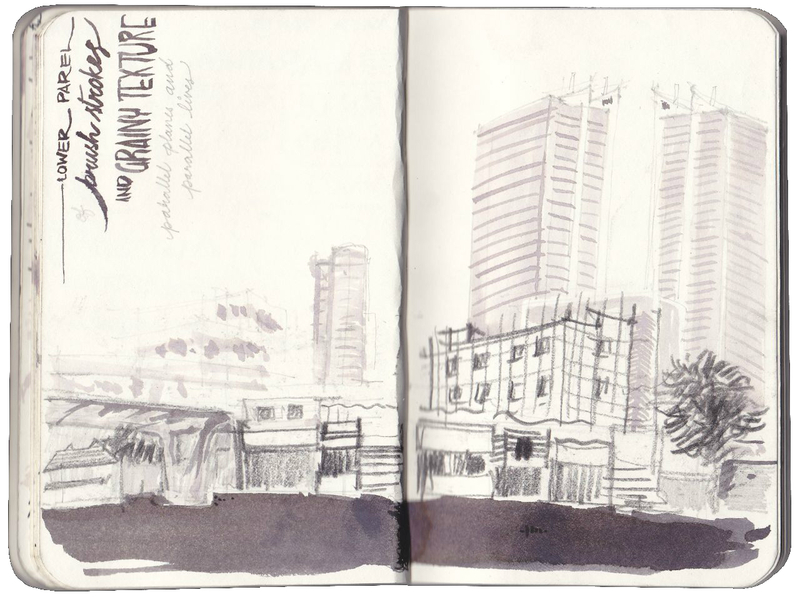 And still every bit of urban space appeared to be well defined and utilized skilfully. 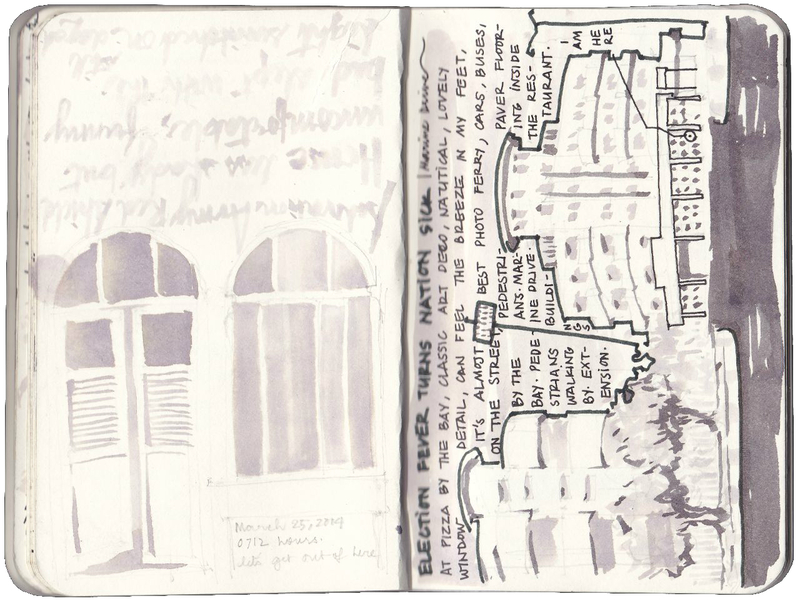 Elsewhere in the city, I had also noticed the seating created on the edge of buildings, places for potted plants by the windows, large doors that could also work like windows when opened partly. 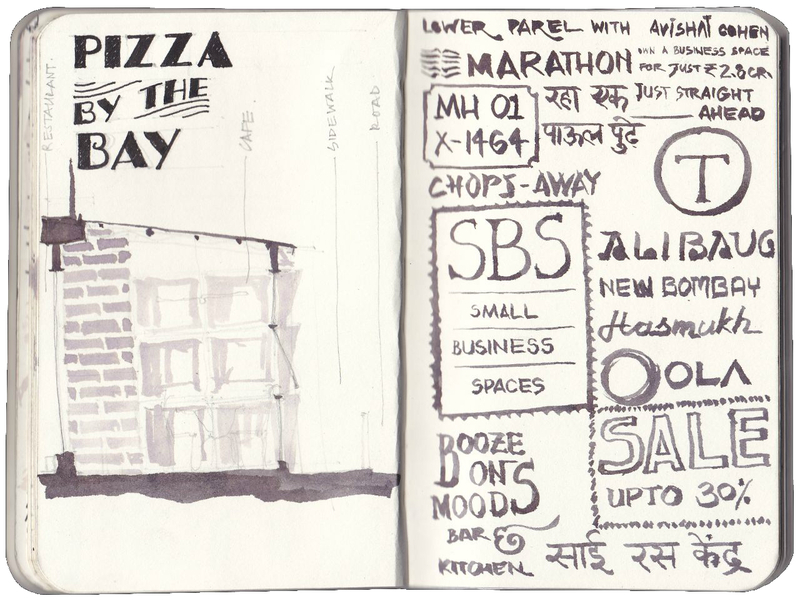 But, Bademiya in Colaba surprised me and inspired me in a whole new way. The main kitchen and seating area in this landmark restaurant are separated by a motorable main street! So it functions like a take-away and a dine-in place with its service circulation space being the most public. I hadn’t seen such sharp intensity in a long while. I remember when we were at Bandstand in front of Salman Khan’s home (whatte landmark! 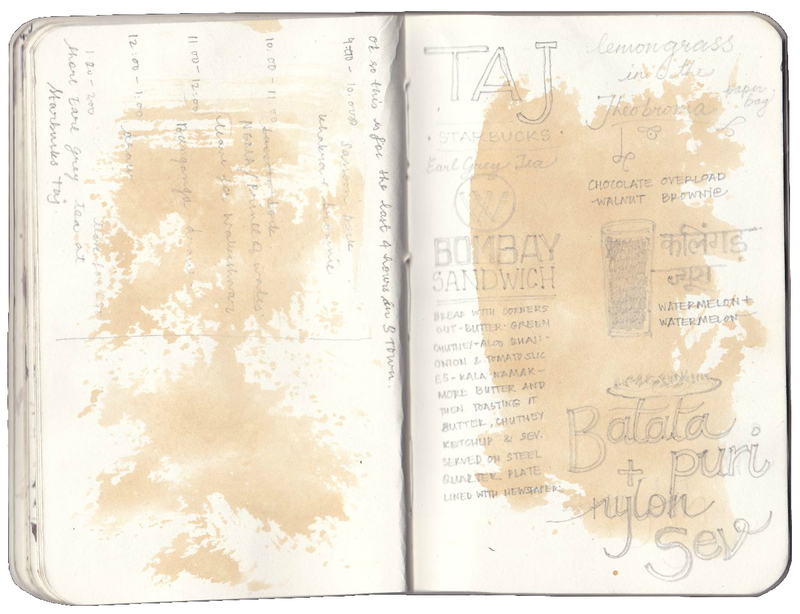 ), Pallavi and I were talking about this thrifty spirit that I sensed everywhere in the city. 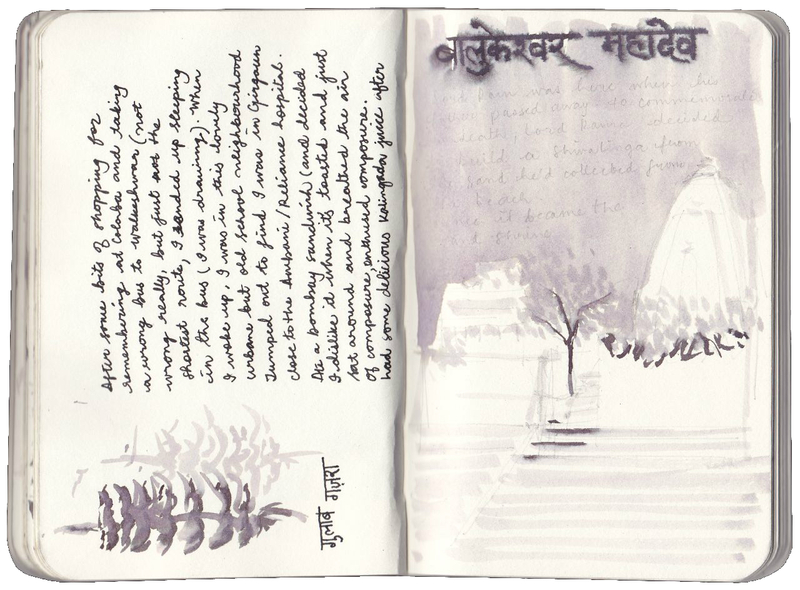 She felt that it comes from how perhaps everyone comes to Bombay and struggles for years, working really really hard. Only then does life get a little comfortable. So it is never embarrassing to have less money. It’s just an ordinary humble life that one shares with most other people in the city; sharing public space and transport. There appeared to be a sense of celebration in this struggle (couldn’t you see the cliché coming?). I was found myself back in Bombay a few weeks ago, this time though, considering whether I would want to move to the city for work. And that thought changed a whole bunch of perspectives. Much of the romanticism was washed away instantly and the city suddenly felt like a dense mass of fast moving objects, racing against time. Architecture could actually be reduced to floating geometry that sits back and observes the city unfold through its people and their transaction. 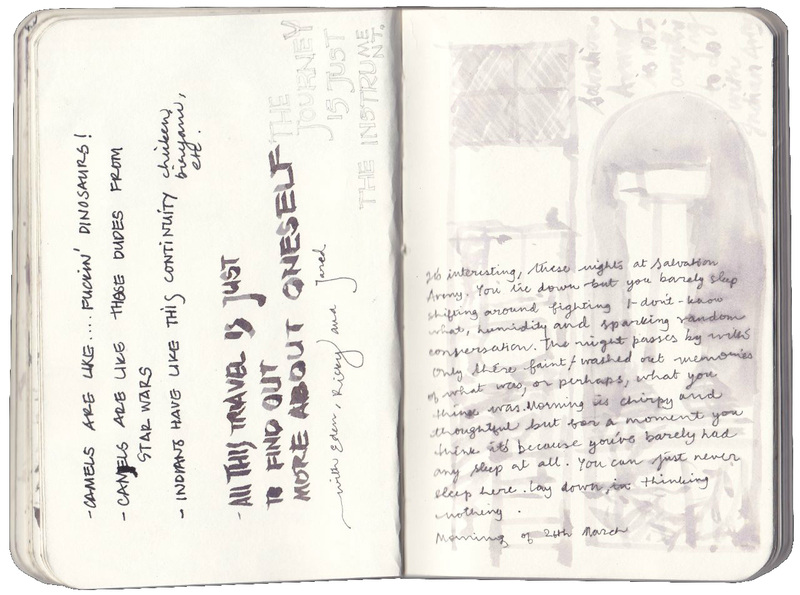 I realized pretty soon that my experience in the city would keep changing every time I would explore it since all of what I saw outside had much to do with who I was within at that point in time. I would still be just another blind man forever looking at Bombay as the fabled elephant. I am an architect and urban planner, a writer and an aspiring artist. I love expressing myself and feel strongly that cities should have spaces for everyone--rich, poor, young, old, healthy and sick, happy or depressed--we all need to work towards making our cities liveable and lovable communities. 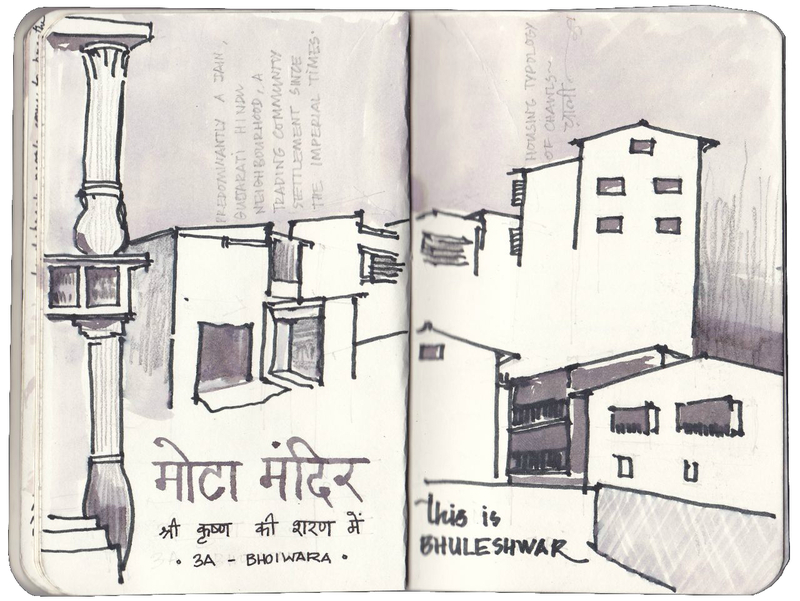 Posted on October 19, 2015, in #TheCityasMuse and tagged architect, art, Bombay, drawings, Mumbai, sketches, travel writing. Bookmark the permalink. Leave a comment.